Perfect for business lunches, after work happy hours, office parties, late night fun, and of course Game Day! Your neighborhood sports bar featuring the NFL Sunday Ticket, Big Ten Network, MLB Extra Innings, and NHL Center Ice packages on 20 flat screen TVs. It also has Golden Tee 2014. 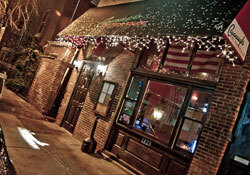 Cavanaugh's Rittenhouse offers a full menu until 1 AM daily.